Guide highlights Civil War history, and unique dining and entertainment venues, across the Mason-Dixon region throughout the 2013 commemoration year. The 2013 edition of the Celebrate Gettysburg Dining & Entertainment Guide commemorates the 150th anniversary of the Battle of Gettysburg. The publishers of Celebrate Gettysburg, Gettysburg’s premier lifestyle publication, have launched a special edition of the Celebrate Gettysburg Dining & Entertainment Guide in commemoration of the 150th anniversary of the Battle of Gettysburg. With the anniversary of the battle just days away, more than 4 million visitors are expected to converge on Gettysburg and its surrounding areas throughout this commemoration year. More than 100,000 copies of the free, digest-size guide are being printed and are now available at distribution locations throughout the Mason-Dixon region, including Gettysburg, south-central Pennsylvania and northern Maryland. A digital edition appears at celebratedining.com and is available for mobile devices (iPad, iPhone, Android). Links to download the apps are available at celebratedining.com. The Celebrate Gettysburg Dining and Entertainment Guide offers readers unique places to eat, shop and explore in the Gettysburg region and beyond during the 2013 battle anniversary events. Restaurant menus, a calendar of events by region, useful visitor orientation information and profiles of regional communities make the guide an essential resource for visitors planning any trip to Gettysburg and other locations in the Mason-Dixon region. The Dauphin County Parks and Recreation, Frederick County Chamber of Commerce, Tourism Council of Frederick County and the West Shore Chamber of Commerce are sponsors for this special edition of the Celebrate Gettysburg Dining & Entertainment Guide. To learn more about the Celebrate Gettysburg Dining and Entertainment Guide, call 888-521-6810, visit celebratedining.com or email sales(at)celebrategettysburg(dot)com. Celebrate Gettysburg is Gettysburg’s premier lifestyle magazine. Published by Graphcom, Inc. of Gettysburg, Pa., the bimonthly publication explores the facets of life that makes Adams County, Pa., a special place to call home and to visit. 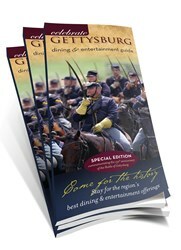 To learn more about Celebrate Gettysburg or to subscribe, call 888-521-6810 or visit http://www.celebrategettysburg.com.